We collect personal information from you when you register for weADAPT, sign up to newsletters and use the website. See the cookie notice for the cookies that may be collected. If you register for weADAPT or to our newsletters (eg to obtain email updates) then we will collect personally identifiable information about you, such as your name, organization, e-mail address, country of residence and other information which you voluntarily submit. This information is used to tailor any promotions and understand the visitor’s use of the website and may be shared with other companies within the group and with other third parties. Google sets a number of cookies on any page that includes a Google Map. Intended to measure the number and behaviour of Google Maps users. Also remembers your preferences such as language and zoom level. Google sets a number of cookies on any page that includes Google Analytics. This is included to help us see how our website is used. Also remembers your preferences such as language. This information is combined with data from thousands of other users to create an overall picture of website use, and is never identified individually or personally and is not linked to any other information we store about you. 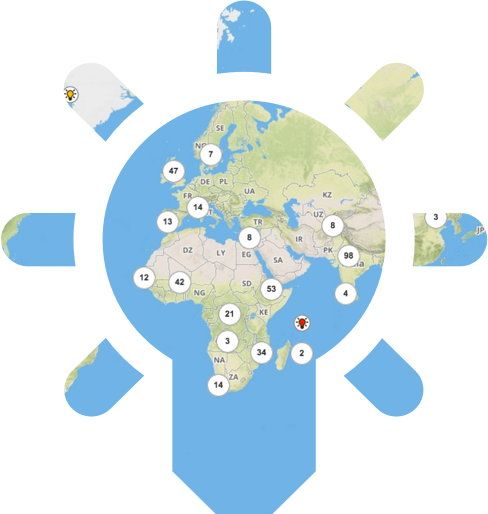 Allows users to share weADAPT content on social networks using the service AddToAny. Collects information such as URL, title, and related metadata. Data is anonymised and can not be used to identify individual users. These cookies are for YouTube which is what we use to host and display videos around the site. These cookies collect anonymous viewer statistics, such as how many users have viewed the videos. We may use your personal data to answer your queries, to make analyses in order to provide you with relevant communication promotion and information, to send you surveys in order to give you a possibility to influence our website, outputs and services. weADAPT uses Google Analytics in order to monitor usage of our website. For more information about Google Analytics Privacy & Terms, please click here: https://policies.google.com/privacy. As part of SEI, the weADAPT team conducts research into knowledge management, co-production and learning and often develops tools and solutions related to these areas. As such, we may use public profile data shared on weADAPT to further this research e.g. to support the development of new tools. However, if you would like your data removed from inclusion in any of our tools, you can do this directly, or contact info@weADAPT.org. If you have elected to receive information from weADAPT, or those of other weADAPT entities, and you wish to opt out of receiving such information, then you can do so by using the following contact information: info@weADAPT.org . If we process personal information about you, then you have a right under data protection law to request access to that personal information. You also have a right to require any inaccuracies in your information to be corrected free of charge. You can ask us to modify any details which are inaccurate by using the following contact information: info@weADAPT.org . Please state your name. weADAPT is hosted by the Oxford Centre of the Stockholm Environment Institute (SEI) which is part of the SEI foundation in Sweden (Stiftelsen The Stockholm Environment Institute).